THEY ALL WORK TOGETHER to OPPRESS THE POOR & ROB THEM, EACH & EVERY TIME THEY CAN GET AWAY WITH IT, IN ORDER TO ENRICH THEMSELVES, EVEN IF IT DESTROYS MANKIND! This is very well illustrated in the following simple publication put out in 1970 simply called WAR, BOOM, BUST or best known in Economics as the Death Triangle: "WAR BOOM BUST ECONOMY"
1. "WAR" CALLS FOR AN INCREASE OF FACTORY OUTPUT (WEAPONS, ETC.). FACTORY INCREASE MEANS MORE WORKERS BEING HIRED AND PAID. This means more people have more money to buy products of all other industries . This increase in jobs and spending is a "BOOM," but this increase in money leads to inflation. INFLATION is when the value of the dollar drops (or the amount of things it can buy drops). It is the old law of "supply and demand." When something is scarce people value it more; when something is plentiful its value drops. 2. THE BOOM IS GOOD FOR THE POOR MAN AND WORKERS EXCEPT PENSIONERS AND THOSE WITH FIXED INCOMES, because even though the money is not as valuable, at least he has SOMETHING. The BOOM is when we have a time of plenty of money, and everyone has got some (even though its value is less) because everyone is involved in jobs to produce weapons of war, and other jobs to provide products that this increased working force will buy. 3. NOW THE BUSINESSMAN, OF COURSE, IS MAKING PROFITS from all this buying and selling. He makes BILLIONS of paper dollars, but these paper dollars have lost some of their value because of the great circulation of them. They are so plentiful people value them less, spend more and are willing to pay higher prices, so the dollars buy less. The loss in value comes from the fact that the sellers of commodities can ask higher prices for their things because they know that with all this money around, some sucker is going to buy their wares. This is INFLATION: MORE MONEY FOR LESS PRODUCT. It is a seller's market! 4. THE OPPOSITE, DEFLATION, IS WHEN THE MONEY IS IN ONLY A FEW HANDS. This is when the sellers have to compete for the favour of the few buyers by dropping their prices to lure him to their place. This is a buyer's market. The money is actually more valuable in such a case because less of it buys the same. 5. THE MERCHANT WITH HIS BILLIONS OF PAPER DOLLARS FROM THE "BOOM" knows that each one of those dollars would be worth more if less people had money to spend. So he lowers the circulation of paper dollars by calling up the King, who in turns calls up the Captain of War and tells him to stop fighting. The Captain of War has no more use for rockets, planes, bombs, tanks, jeep, army clothes, boats, bullets, 3.2 beer and all the multitude of things necessary to fight a war. 6. 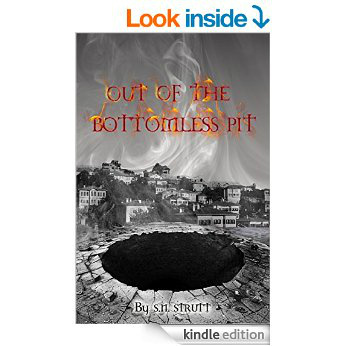 THE MERCHANT STOP HIS ASSEMBLY LINES AND THE WORKERS ARE SENT HOME AND THE PAY-CHECKS STOP. The other industries that don't make war equipment soon stop making idols because the employees of the war industries have no paychecks to buy their idols with. This starts a chain reaction that even goes as far as the manufactures of necesities (food, clothes, houses, etc.) who have to stop producing necessities because now the workers of both WAR and commodity factories have no paychecks! 7. SO EVERYONE IS BROKE AND STARVING, BUT THE MERCHANT IS HAPPY BECAUSE THE VALUE OF EACH ONE OF HIS PAPER DOLLARS IS INCREASING because they become so scarce and buy more at lower prices. People will give up their houses and cars just to get their hands on a little money. The money is now worth a lot more because of its scarcity. THIS IS A "BUST", recession, or depression. This eventually ends with most of the people selling their possessions for a little money and the Big Merchant ends up with everything ( Gen.47:20 ). Of course, there is always the chance of a workers revolt at this point (Revolution). 8. SO THE MERCHANT TAKES A FEW STRAWS OFF THE CAMEL'S BACK by having the King open up some soup lines, and even a WPA scene (government work projects). Sometimes it is cheaper to keep the workers in line by giving them a few crumbs, than it is to contain them with firepower (police, guards, etc.). A few soup lines are cheaper to maintain than an armed occupation force. 9. BUT THE QUICKEST WAY OUT OF A SEVERE DEPRESSION IS, OF COURSE, TO START ANOTHER "WAR". THIS COMPLETES THE CYCLE by opening the war factories which puts enough money (paychecks) on the streets for the commodity factories and manufacturers of necessities to start producing and selling again. This is the method by which the poor members of the Beast must support the Whore! ( Rev.17:7 & 18:23-24 )!--"Come out of her!" ( Rev.18:4 )! 10. BUT THE VIETNAM WAR IS MANIFESTING A PECULIAR PHENOMENON. The threat of Revolution is so impending and well-advanced, that the powers that be (Business, Politics, Armed Forces) are aware that a recession would set it off. They know that a few soup lines, and lying promises won't be enough to hold back a Revolution in the event of a recession (which would be inevitable if the war ceased). They are also aware that their present policy of feeding the youth of the Nation into the war machine (Molech Phase II--Jer.32:35) is also fuel for agitating the revolutionary element: so, either way--TROUBLE! 11. BUT THE WARMONGERS ARE PULLING A FAST ONE THIS TIME. They are trying to pull a compromise by replacing the American soldiers with South Vietnamese, and keeping the war running to maintain the sick economy. So Big Business continues to produce war toys, well-lubricated with the blood of human sacrifices, as usual. But, the sacrifices are now coming from another nation to take the heat off back here. It looks like the Vietnamese flower children have been elected to be the cannon fodder that handles the diabolical war toys of the DEATH CULT'S genocidal "economy". It looks like the DEATH TRIANGLE has weaseled its way out of an impossible situation. But they made a mistake: THEY FORGOT GOD! "Be not deceived, God is not mocked"--God knew about the child sacrifice game a LONG TIME AGO ( Ezek.16:20-21 , 23:39 ). SEE VIDEO ON "WAR BOOM BUST" BELOW! Have you ever wondered why we have war, or why there is such a disparity of wealth? Why some people and whole nations are rich and overfed while others are starving? I used to wonder why the world is the way it is, why there couldn't be more love and peace and cooperation among people and nations to make the world a better place. 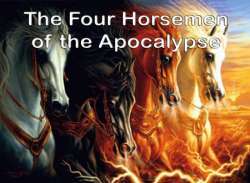 I found the answer to that in the Bible, beginning with Revelation chapter 6, about the four horsemen of the Apocalypse. In Revelation chapter 6, Jesus opens the book of the future, the book of prophecy, which is sealed with seven seals, and shows the apostle John the future of the world from that time (about 90 Ad) to the last days (the time in which we are now living) and beyond. We find another picture of a white horse in Revelation chapter 19: "And behold a white horse; and He that sat upon him was called Faithful and True. ... His name is called The Word of God" (Revelation 19:11,13 KJV). We know from John 1:14 that "The Word of God" is Jesus: "The Word became flesh and dwelt among us, and we beheld His glory, the glory as of the only begotten of the Father, full of grace and truth." So the first horseman, who wears a crown and goes forth to conquer, is obviously Jesus. And following Jesus are the armies of Heaven, who are also riding white horses as they come down from Heaven to defeat the forces of the Antichrist and take over the world at the Battle of Armageddon (Revelation 19:14). What takes "peace from the earth"? War! This red horse symbolizes war, the military and their war machines. The horse's color, red, is appropriate because it represents all the blood shed in man's hellish wars? Wars for which God is not responsible, but which come from the pride, prejudice, and avarice of man's heart. "From whence come wars and fightings among you? Come they not hence, even of your lusts that war in your members?" (James 4:1 KJV). This black horse's rider with the pair of balances in his hand symbolizes the rich capitalists that have a major impact on world conditions through their manipulation of national economies. Only one other verse in the Bible pictures a man with balances, or scales: "The merchant uses dishonest scales; he loves to defraud" (Hosea 12:7 NIV). Another prophet, Amos, also said that the merchants? The wealthy capitalists of his day who were robbing the poor instead of helping them? "set forth wheat, making the ephah [unit of measure] small, and the shekel [price] great, and falsifying the balances by deceit ... that swallow up the needy, even to make the poor of the land to fail" (Amos 8:4,6 KJV). The black horse, then, represents famine and poverty perpetrated by the rich who refuse to share with those in need. Oil and wine, throughout the Scriptures, symbolize abundance or luxury. The fact that the oil and wine were "hurt not" indicates a situation where wealth and luxury exist alongside famine and poverty?and the gulf between rich and poor is only growing. The fourth and final horseman of the Apocalypse is death itself?death not only from war, but also from beasts and plagues and famine and death in every other conceivable form. Death has always been with us, of course, but death by famine, natural disasters, new plagues such as AIDS, and new epidemics have reached unprecedented levels, just like Jesus said they would immediately prior to His return: "And there will be famines, pestilences, and earthquakes in various places" (Matthew 24:7). War, greed, and death?the characters that were revealed when the second, third, and fourth seals were opened?are almost as old as the world itself, but the Biblical picture both here and elsewhere is that each of these forces has taken on greater power since the time of this revelation. Jesus predicted this in His famous Endtime discourse, Matthew chapter 24, and said that it would culminate in "great tribulation, such as has not been since the beginning of the world until this time, no, nor ever shall be. And unless those days were shortened, no flesh would be saved" (Matthew 24: 21,22). In other words, Jesus was saying, one day man would reach such an impasse that if God were to let him continue unchecked, he would annihilate himself. However, when man finally reaches that suicidal point, Jesus said that God would step in and stop man. And the way God will stop him is by Jesus' Second Coming, when He returns to punish the wicked, take over the world, and set up His right­eous rule (Matthew 24:29,30; Isaiah 9:7; Jeremiah 23:5; Revelation 19:11,21). Only within the last 50 or 60 years has the human race developed the potential to destroy itself. The military (red horse) now have their nuclear bombs, intercontinental missiles, chemical and biological weapons, and other lethal technologies. The rich, on their black horse, were complicit in the last century's great wars, and their hoarding and misuse of their riches is threatening more wars and violence. The rich also, in their relentless pursuit of greater wealth, are finally succeeding in polluting the entire earth? A by product of modern technology. And following the others comes the fourth horseman, on the pale horse?death in every form. So there you have the four horsemen of the Apocalypse. 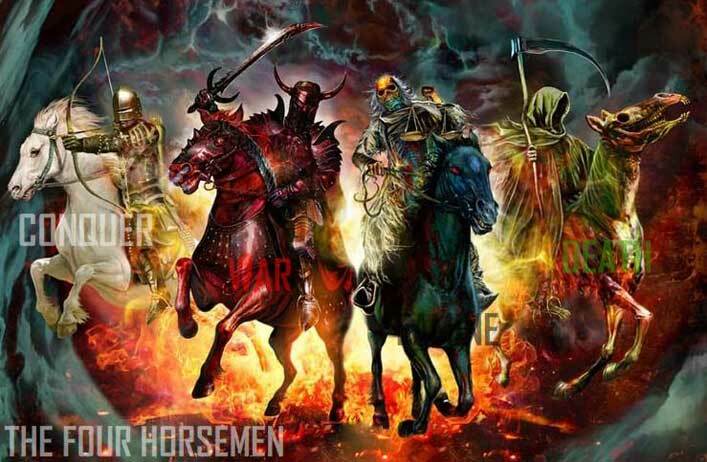 They will continue to ride until the End, when Jesus returns to take us to heavenly places with Him, before pouring out His judgments on the perpetrators of the hell on earth below. Then He will come back once more to wipe out the Antichrist and all of his forces at the Battle of Armageddon. God will then cleanse and purify the earth and set up His eternal kingdom, ruled by Jesus Christ. I will expand on this particular prophecy of Daniel 9 shortly. Concerning conspiracy theories it occurred to us that we had not seen the topic approached from a completely Biblical standpoint, although during the course of our reading etc. We have seen scripture used to support many different aspects by different writers in their efforts to expose the conspiracies. We thought that something that was solely based on scripture could be useful in helping to convince some Christians, who are either unaware of different conspiracies or have a difficult time in believing such conspiracies exist or that key members of their government, business communities, etc. could be involved in such conspiracies. All the way from Genesis to Revelation we find conspiracy and deceit as one of Satan's major modus operandi. After fear, it seems that conspiracy, deceit, lies, etc. is one of his most frequently used tactics in pursuit of His ultimate goal, to become a god and incur the worship of mankind and the human race. The goal is the rise of Satan, whom the Bible calls “the god of this world”,(2 Corinthians 4:4), and his worship by multitudes in the form of a man the Bible refers to as the Beast, and more commonly known as the Anti-Christ along with his soon coming Mark of 666 described in the Book of Revelation, chapter 13, verses 16-18. The people and organizations involved in helping to bring about the rise of the antichrist are actually only the physical manifestation of where the conflict is really taking place, the spirit world, where Satan and his demons are working to complete their plan. The Bible says in 2Timothy, Chapter 3, verse 1 and 13 “This know also, that in the last days perilous times shall come…evil men and seducers shall wax worse and worse, deceiving, and being deceived”. (Longman New Generation Dictionary defines “deceive” as “to accept as true or good what is false or bad”.) Conspiracy is defined in various dictionaries as a “secret plan”, “plot”, “devise” “to plan together secretly” etc. One of the actual signs of the “Last Days” is a growing and increasing amount of deceit in the world, or something appearing to be good and true when in fact it is false and bad. Paul wrote in 2 Corinthians, chapter 11, “But I fear, lest by any means, as the serpent (Satan) beguiled (deceived – Longman New Generation Dictionary) Eve through his subtlety, (not immediately obvious, crafty) so your minds would be corrupted from the simplicity that is in Christ. All the way back in Genesis, chapter 3, we see that Satan used deceit to actually cause the fall of man. He made something appear to be good which was actually bad, the Tree of the Knowledge of Good and Evil. He has used deceit from the very beginning. Discernment is not be able to tell the difference between right and wrong , but being able to telling the difference between what is right and what appears to be right when it is actually wrong. The true yard stick we have for measuring truth is the Bible, the Word of God. As the Bible says in Proverbs 14:12, “There is a way which seemeth right unto a man, but the end thereof are the ways of death”. Jeremiah 17:9 says “The heart is deceitful above all things, and desperately wicked: who can know it”. Revelation 13:13-14 states, “And he (the false prophet) doeth great wonders…and deceiveth them that dwell on the earth…that they should make an image to the beast”. Here we have the False Prophet and the Beast (Antichrist) conspiring together to get the peoples of the world to worship this image of the Beast or be killed. How could anyone be so deceived? It is because they reject the truth. 2 Thessalonians 2:10-11 says, “And with all deceivableness of unrighteousness in them that perish; because they received not the love of the truth, that they might be saved. And for this cause God shall send them strong delusion, that they should believe a lie:”. In virtually every book, newsletter, video, etc. it always gets around to explaining who these conspirators and deceivers are, it is explained that they are the wealthiest amongst us. Once again the Bible over 2500 years ago pin-pointed who these people are that Satan and his demons are using, and the Bible is in agreement that they are indeed the great and wealthy men of the earth. Hosea 12:7 says, “He is a merchant the balances of deceit are in his hand. Revelation 6:5-6 says, “..And I beheld, and lo a black horse; and he that sat on him had a pair of balances in his hand. And I heard a voice in the midst of the four beasts say, A measure of wheat for a penny and three measures of barley for a penny;…”. And Revelation 18:23 which says, “…for thy merchants were the great men of the earth: for by thy sorceries were all nations deceived”. And let’s not forget 1 Timothy 6:10, “For the love of money is the root of all evil”. And what does money buy? Money buys power, which some have described as “the ultimate aphrodisiac”. The dictionary describes aphrodisiac as “a medicine, drug, etc. causing sexual excitement”. The only act of violence Jesus ever carried out that is recorded in the Bible was when he whipped the money changers out of the Temple. The international bankers of His day. Is it any wonder then when Babylon, the Great Whore is destroyed the merchants or the earth weep. “With whom the kings of the earth have committed fornication, and the inhabitants of the earth have made drunk with the wine of her fornication” Revelation 17:2 and “For all nations have drunk of the wine of the wrath of her fornication, and the kings of the earth have committed fornication with her, and the merchants of the earth are waxed rich through the abundance of her delicacies”. Revelations 18:3 “The merchants of the earth shall weep and mourn over her: for no man buyeth their merchandise any more: The merchandise of gold, and silver...and and slaves, and souls of men. Revelation 18:11-13. The Bible exposed all of this thousands of years ago. Jesus said in Matthew 6:24, “No man can serve two masters: for either he will hate the one, and love the other: or else he will hold to the one, and despise the other, Ye cannot serve God and mammon”. Matthew 24, one of the most prophetic chapters in the Gospels, Jesus Himself warned us repeatedly against the dangers of being deceived. “Take heed that no man deceive you…For many shall come in my name, saying, I am Christ; and shall deceive many…many false prophets shall arise and shall deceive many…for there shall arise false Christ’s, and false prophets, and shall shew great signs and wonders: insomuch that, if it were possible they shall deceive the very elect”. In contrast, the Bible in Isaiah 53:9, in a prophetic description of the coming Messiah Jesus, describes one of his outstanding characteristics that “…neither was any deceit in his mouth”. Jesus said in John 14:6, “I am the way, the truth, and the life: no man cometh unto the Father, but by me”. May God bless us with the wisdom and discernment we will need in the days ahead. There used to be an old saying, “Don’t shoot till you see the whites of their eyes!” Maybe that was what was said by military commanders 200 years ago or so. But the idea I guess was that you don’t shoot your gun till the target is close enough that you can actually see what you’re shooting at. And that principle could certainly apply to modern pronouncements on Bible prophecy. I’m appalled at times by how many people are convinced without a doubt that… (take your pick) …Obama is the Antichrist? The Pope… no, wait; Islam is the seedbed and fountain head of all evil, the primordial force of Satan in the last days? And on it goes. “They” are out to get us. Five years ago in Houston I was in a gathering of sober and sincere Christians and we were told that the roads out of Houston would be blockaded within 6 months… 6 months I tell you!… and everyone would be corralled in FEMA camps. A very serious Christian brother was telling this to us. That was in 2009. And on it goes. As a person who utterly believes in the coming of the Lord and that we’re very likely living in the endtime, it interests me and also saddens me that there are so very many “Wolf, Wolf” calls coming from so many Christians at this time. The Apostle Paul said, “Judge nothing before its time…” (I Corinthians 4:5) But this admonition is rejected or forgotten by so many Christians today as they jump on their soap box or band wagon to shout the latest “warning” which ends up being another false pronouncement and false dawn of troubles to come. Invariable there is no accountability for the false proclaimer of immediate doom. But without hesitation or twinge of conscience they’ll re-proclaim their next declaration of imminent doom for a date another 6 months away. And virtually no one calls them on it or takes note of these ones who constantly proclaim imminent woe and it doesn’t come to pass as they’ve told us it would. And yet I don’t disagree with much of what they are saying; just the continual over-specific-ness of their declaration, plus the fact that so often they just end up plain wrong. That’s the problem. Very many see and realize that we live in dire times. But the common thing to do for many Christian commentators is to personally declare that some very short and specific length of time will expire before “the very end” is upon us. Like the guy said, “Don’t shoot till you see the whites of their eyes”. Jesus actually gave us some very specific things to look forward to, in the gospels, concerning the times leading up to His return. In my video series on the book of Daniel I have gone over some of those specific points, such as the appearance of “the abomination of desolation, spoken of by Daniel the prophet, standing in the holy place”. (Matthew 24:15) This was the sign Jesus said to watch for which would mark the beginning of the “great tribulation” (Matthew 24:21) which is said to be in a surprising number of places a length of time of 3½ years. Jesus said, “Immediately after the tribulation of those days” (Matthew 24:29) is when He would return to gather His elect, His people. I utterly believe this and numerous other things that are solid, bedrock doctrines that completely hold up to scrutiny. But present Christian dialog among believers on the coming of the Lord is cluttered, strewn and clogged with false declarations and false declarers. It seems the gullibility of His sheep is successfully taken advantage of over and over again. Does it matter? Can’t we just go on enjoying the latest shout of woe, regardless of whether it is founded in God’s truth and actual reality? Jesus said “It would be better that a millstone be hung about your neck and that you be drowned in the sea than that you offend one of these little ones” (Matthew 18:6), one of His searching sheep, longing for the truth and looking to what they can find in Christianity to see if the truth is there. How many are stumbled and turned away by the sensationalists with their latest announcement when they see that their prophecy of imminence fell through and they were just another empty vessel? God help us to have a higher standard. Jesus said He was the truth. (John 14:6) The Holy Spirit is “the spirit of truth” (John 16:13). So many who are involved with teaching prophecy would do well to heed the warning of centuries ago when it comes to foretelling the future. “Don’t shoot till you see the whites of their eyes”. Don’t keep proclaiming things that must imminently occur when you really don’t know that for certain in Him. If you have a record of yelling “Wolf, Wolf” to the extent that you stumble the weak and are a pitiful testimony of the Lord’s Word and truth, please stop for your own sake, for the sake of His sheep and for the witness of Christ that is besmirched.